We're happy to announce the launch of our ClearCheckbook Affiliate Program today. This program rewards you with 10% of the premium membership upgrade price for any user you get to join ClearCheckbook. When you become an affiliate, you will receive a unique URL that you can send out. Once a user registers after clicking on your link and then upgrades to ClearCheckbook Premium, you'll be eligible for 10% of their upgrade and all subsequent renewals. We provide you with a dedicated affiliate dashboard where you can track all of the users who have signed up through your Affiliate URL. In order to be paid out, a user you've brought to the site and who has upgraded must have let the membership go through one cycle. This means if they sign up for a monthly membership, you will need to wait one month before that membership counts toward your account. All payments will be made by either a mailed check (US residents only) or via Paypal. This has been in use by a few users in the past but it's something that we wanted to make available to everyone. If you have any questions about the ClearCheckbook Affiliate Program, please let us know! For more information and to sign up, please check out our ClearCheckbook Affiliate Program page. The price of our ClearCheckbook Premium upgrade will go up $1 per month starting on March 24, 2017. All existing Premium members will be grandfathered into the existing price. We introduced the ClearCheckbook Premium Membership upgrade over 8 years ago, back in December of 2008 when the site was less than 3 years old. Since then we've grown more than we ever imagined. Along with the tremendous growth and keeping up with the latest technologies comes ever more costs associated with running a site as large as ClearCheckbook. Since our launch in 2006 we've never taken a single penny of outside investment money which is something we're rather proud of. Every cent we've earned and used to build, host, develop and maintain ClearCheckbook and our associated apps has been made by those of you who have opted to upgrade to ClearCheckbook Premium. ClearCheckbook wouldn't be here today if it weren't for those with a ClearCheckbook Premium upgrade, and for that we thank you. While the ClearCheckbook bank account has funds to keep the website hosted and operational for years to come, that isn't good enough in today's technological landscape. We need to keep up with the ever changing mobile environment and make sure our mobile apps are up to the same standards as the website. Mobile app development doesn't come cheap and we want to make sure we're able to keep our apps updated more regularly and get more of the features you want added to them. With the recent re-launches of both the iOS and Android apps this has become more apparent to us than ever. Those apps were originally designed when the mobile landscape was much different than it is today. Our apps were meant to be a quick reference for checking your balances and budgets and to make it easy to add transactions on the go. We've discovered that as smartphones have gotten faster and cell providers have increased their connection speeds, people want more out of the app than the simple interface we currently provide. In addition to the mobile apps, the act of keeping ClearCheckbook running smoothly as growth explodes is an endeavor with ever increasing costs and complexities. Those of you who have been with us for many years might remember some of our big growth spurts that resulted in site down-time or long load times. We want to make sure these issues remain "things of the past," and that means upgrading hosting plans and hardware long before it becomes a critical necessity. Raising the price of the membership wasn't an easy decision but this will help us stay innovative and give you a much better experience both on mobile devices and the website itself. Like we said above, all users with an existing ClearCheckbook Premium upgrade as of March 24, 2017 will be grandfathered into the existing rates. If you're currently a free user and want to upgrade with the existing rates, you'll need to upgrade between now and March 24. You can learn more about ClearCheckbook Premium and how to upgrade here: https://www.clearcheckbook.com/premium/info. Again, I'd like to extend my deepest thanks to our ClearCheckbook Premium members. You are the life-blood of the site and your continued patronage to ClearCheckbook has made the site what it is today. 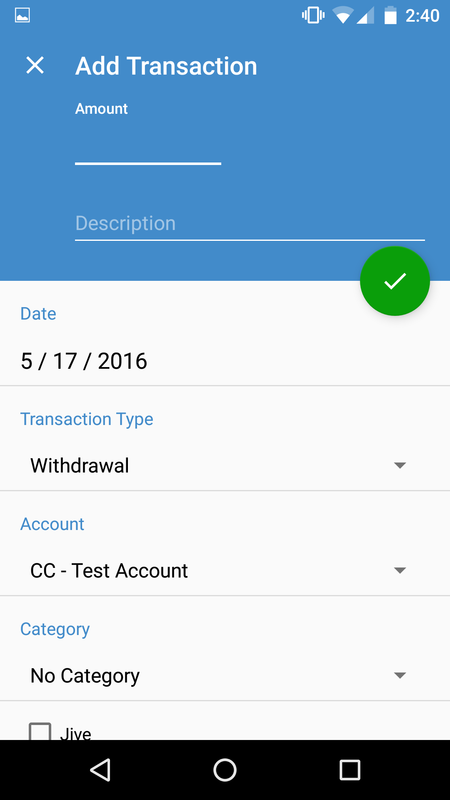 ClearCheckbook MoneyManagement 2.0 for Android available for download! The completely overhauled and revamped ClearCheckbook app for Android has been finished, tested and is now available for download on the Google Play store! The new app should be much faster to use and also fixes a lot of bugs and addresses a lot of feedback we received from you. You should be able to update the app through the Google Play store soon, if it isn't already available. We were able to catch and fix a lot of issues in our internal testing and beta testing, but if you experience any other issues please let us know and we'll work on getting it quickly resolved. We'd also like to point out that we'll be adding an "All Transactions" register view to the app shortly, since it's currently not available on the app. We'd also like to give a special thanks and shout-out to the developer of the new app, Russell Stewart, for his speediness and professionalism through the entire development process. If you're in need of getting an Android app developed, please consider Russell. You can contact him through the following outlets: LinkedIn, StackOverflow or Facebook. We've been busy with a lot of updates and upgrades to the systems that run ClearCheckbook and our mobile apps. This blog post will cover a lot of those changes and how they affect ClearCheckbook. 1. DNS / SSL Updates - The biggest change this week has been switching DNS servers and SSL certificates. Our old DNS provider was discontinuing service so we found an alternative that also has some really cool features such as automatic asset minification and caching which have cut down bandwidth by over 50% daily. 2. Android app connection issues - When we switched DNS servers we started receiving messages from some Android app users saying the app would no longer connect. At first we thought it was simply a DNS propagation issue but after a few days of people still having problems, we finally figured out that it was due to the new SSL certs that use the latest ciphers not supporting some legacy Android versions and really old versions of Windows. Once we discovered this we were able to make some changes to the way SSL certificates are handled and provide an older certificate for these antiquated systems, while still serving the most recent and secure certificates to modern day technologies. 3. API updates for mobile apps - We've been busy making updates to the API for our mobile apps which include adding the Bill Tracker and currency + conversion methods. The current iOS app is almost finished being updated to add the Bill Tracker as well as the auto-complete feature. 4. Android app 2.0 - Our developer is finishing up some of the last pieces of the new Android app and we'll be launching the previously mentioned beta testing very soon. Thank you for those who have submitted your information to our beta testing program. We'll be sending out invites soon to download and start testing the beta app. If you're interested in helping us beta test the new Android app and haven't already done so, please sign up to be a beta tester! 5. Updated Pie Year Charts - We realized that our old 'Pie by Year' charts weren't that helpful. They were small and didn't show all of your spending in a very intuitive way. With the update to the Pie Year Charts, we now use one large chart that shows both parent and sub categories on the same report in a very nice and clean way. Below the report we also have a breakdown of each of your categories with total spending for the year. This new view of your spending for the year is a great way to help figure out where you can cut back on for 2017. We also recommend taking a look at the chart and using the information from 2016 to help you set your 2017 budgets. The Pie Year Chart is available to all premium members and can be found by clicking on 'Reports' at the top of the page, then click on the 'Categories' tab and finally 'Pie by Year'. We want to apologize to anyone that was affected by the DNS/SSL legacy issues but those have all been sorted out and we hope you're able to connect without any issues now. There's been a lot of activity behind the scenes lately and soon you'll start to see some of that make its way up front in the way of the mobile apps being updated (iOS) and overhauled (Android). If you have any questions about these upgrades or simply want to leave us any comments or suggestions, please let us know! Update: It appears there's an issue with older versions of Android and the updated SSL certificate we're using. The new certificate uses protocols that aren't supported by old versions of Android (<=3.0) and some very old operating systems. We're working on a fix for this now. Last Friday (February 3) we had to switch our DNS servers due to our previous one discontinuing service this month. There seems to be some lingering issues with the Android app not connecting with our site for some users and showing No accounts / No balances. All of your data is actually fine and secure on our servers (since no data is actually stored on the app). We believe it's simply a DNS propagation issue and it should be resolved with time. Until that happens you can always access your accounts, balances, budgets and more by visiting https://www.clearcheckbook.com from the browser on your phone. We're monitoring the situation to see when it starts clearing up. The problems don't seem to be affecting everyone which is what makes us think it's taking some time for some Android phones to get the updated DNS information. We've tested logging into the app from several of our own Android devices and it's been working properly. If you previously had this error in the last few days and then it started working again, please let us know. We will be running a test to switch to new DNS servers on Friday February 3, 2017 at 10pm ET. We're not anticipating any downtime but we wanted to make you aware of the maintenance just in case. 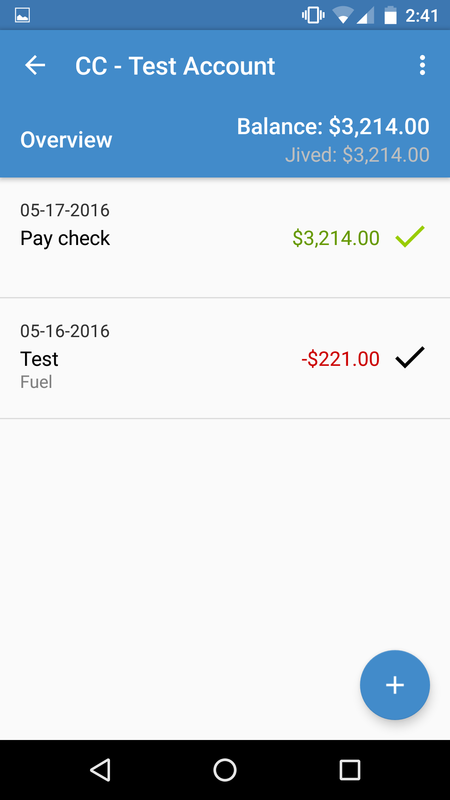 We're happy to announce that the new ClearCheckbook Android app is nearing completion and we'll be ready to start beta testing it soon. If you're an Android user and would like to sign up to help us beta test the app, please submit the email address associated with your Google Play account on our beta signup page here: https://www.clearcheckbook.com/android/signup. Beta testing for the app will run for a couple of weeks which should give us time to address and fix any bugs or issues with the app. After that we'll launch the app to the public. We've been putting in a lot of work into our API to make sure the Android app (and the iOS app) will be great tools for you. We'll also be releasing a big update to the iOS app soon that will contain auto-complete and the Bill Tracker. ClearCheckbook iOS app now available! We're happy to announce that the ClearCheckbook app for iOS is now available for download in the App store. The app has been completely redesigned from the ground up using the latest iOS development tools and technologies which will help future-proof it for upcoming updates to iOS. The ClearCheckbook iOS app behaves similarly to the old app and has most of the same features. One thing to note is to edit or delete any accounts, transactions, budgets, reminders or categories, simply swipe the item to the left and you'll be presented with an option to edit or delete it. This is just the first iteration of the app. We've got a lot more updates for it in the works and will let you know more about those in the future. We want to give a special thanks to all of the users who helped beta test the app over the last few weeks. You provided some extremely valuable information that helped us catch and fix a lot of issues. If you have any issues while using the app, please use the Contact Us form at the bottom right side of ClearCheckbook.com and we'll work on getting any problems fixed. We're making some final updates to the last version that was out for beta testing and plan on submitting the app to Apple this week for review. We'll have more information and screen shots when we actually submit the app for approval. This blog post will cover a lot of new features, mobile app updates and bug fixes that we've been working on recently. We just added the ability to create groups to help you organize your accounts. Each group will be separated within your Account Overviews with their own 'group total' balances. You also have the option to exclude a group from being added to your overall balances. To start using the account group feature, click on Settings at the top right side of the page, then click on Accounts. Below your list of accounts you'll see a new form to add a new group. Once you've added a group you can assign new or existing accounts to them. Note: Account Groups requires an active Premium Membership. The developer we contracted to rebuild the app has finished all functions of the app itself. We're now going through and testing all the sections of the app for bugs and any issues. Once that is done we simply need to update the UI and we'll be ready to launch. I hope to have some screenshots of the app with the new UI available soon. Most of the recent bug fixes revolved around input validation to make sure that when you're adding, editing or deleting transactions, reminders, budgets, etc you won't run into unexpected results based on the data you enter. There were also some tweaks to the Import Transactions tool to better recognize data fields and automatically match them on the field verification page. Running balances also got an update that fixed some issues with the balances not showing up correctly if you started paging through your transactions. In addition to all of the above, ClearCheckbook just turned 10 years old today! I launched the site back in May 2006 as a way for myself and some friends to manage our personal finances. The site has grown and improved tremendously over the years due in large part to the suggestions of you, our users. We'll have more news about the mobile apps soon. We've been getting a lot of questions lately regarding the iOS app so this update is meant to address all of those. The app is still being worked on but doesn't have any real UI applied to it yet (the developer is getting all the functionality nailed down and then we'll get it looking pretty). Once we start adding the UI we'll post some screenshots and updates. May 4, 2016 Update - The developer is wrapping up the last section, reminders, now. After that's done we need to go through and do some final testing and complete the UI. We'll have more information soon. May 18, 2016 Update - All functions of the app have been coded and implemented. We are now updating the UI and in the process of running through the app to catch any bugs. We've fully migrated from our old host to the new hosting solution. We'll be monitoring traffic and bandwidth over the next few days and scaling the various systems to match our demand. This transition ensures that we can easily scale to match demand as the site continues to grow. We'll keep you all posted over the next few days about updates to the mobile apps and more. If you're getting an SSL issue, make sure you're visiting https://www.clearcheckbook.com and not https://clearcheckbook.com. For some reason our redirecting isn't working properly but we're trying to figure that out. We will be moving ClearCheckbook from our current server to the new cloud based hosting solution Friday night at 12am ET (9pm PT) on October 30th. All of our tests runs indicate the site will be offline for about 2 hours while we backup all data, transfer it to the new host and then import all the data to the new database. We'll be communicating progress throughout the migration as well. None of your data will be lost or affected during the migration. We will have more information regarding the mobile apps after the migration has been completed. Welcome to ClearCheckbook Version 4! This has been a long time coming but we can finally say that we've launched the next great version of ClearCheckbook! V4 is the culmination of months of hard work spent re-writing code, updating the UI, adding new features, implementing suggestions and a lot of beta testing. The goal of this update was to keep the site as similar as possible to what you're used to while updating the UI to be more friendly across all platforms, devices and screen sizes. While the site looks different, most of the behavior and locations of tools, links, menus, etc are the same as they were in the last version. 1. If the site looks weird, graphics aren't loading or you're having problems getting the site to work, please clear the cache in your browser. The easiest way is by refreshing the page about 5-10x in a row really quick. 2. During beta testing, some users complained about issues with contrast between elements on the site. We tracked this down to monitor angle issues or screen color calibration problems. If all the colors seem washed out, try adjusting your monitor angle or running a color calibration on the screen. Now, on to what's new in V4! Hover over sub category to see parent name. Provides more accurate historical data in case you added transactions after the budget had reset. As you can see, there are quite a few updates to check out. This is just the start though. One of the major driving forces behind the V4 update was to better future-proof the site by adopting modern web technologies. This will make it much easier for us to add new features, tools and updates to the site. The next step for us is focusing on much needed overhauls to all of the mobile apps. We put those on the backburner for a while so we could get the main website updated. Now that V4 has been launched we can go back and spend time on the mobile apps. ClearCheckbook started out as a tiny program I built and ran on my laptop so I could manage my own finances while I was in college. In the past 9 years ClearCheckbook has gone from something only I could access to a site with over 300,000 registered users managing over 60 million transactions. I just wanted to take a moment to say thanks to all of you for helping ClearCheckbook grow. Whether you've been around since the beginning or just found the site, I'm happy to have built a site that's constantly evolving to fit your financial needs. Thanks again and enjoy V4! ClearCheckbook V4 Beta testing is in full swing! We've had some users testing out the new version of ClearCheckbook for a few weeks now and so far the feedback has been great. Since the initial round of testing was limited to a fairly small group, we'd like to open up testing to more people. If you're interested in being one of the first people to try out the next version of ClearCheckbook please leave a comment on this blog post or use the Contact Us link at the bottom right side of the page to let us know. We've been hard at work the last couple of months on completely overhauling the code behind ClearCheckbook. The technology running the site you see and use today remains relatively unchanged since we launched ClearCheckbook V3 and the premium service back at the end of 2008. A lot has changed since we built V3. Old technology stops being supported and new technology comes in and takes its place. The goal of ClearCheckbook V4 is to modernize the site to help us quickly and easily release updates that can take advantage of the latest developments in both the computing and mobile world. The next version of ClearCheckbook will be fully responsive (so it scales properly based on screen resolution) and the design will be more consistent throughout the various tools. We're going to great lengths to make sure we don't change the layout too much so you'll still be able easily recognize and perform all the same tasks you do right now. The logo is also getting an upgrade. We got rid of the bevel and drop shadow and updated the check mark and checkbook. The new logo has been added to the current site while we finish up V4. Over the next few months we'll slowly start opening up V4 to testing starting at an invite only basis for some of our most active users. We want to make sure the transition between the current site and v4 is as smooth as possible so getting real hands-on feedback will help tremendously with that effort. Here are a couple screenshots from our current development site running V4. The screenshots show the updated Dashboard page as well as the updated Reminders / Recurring Transaction tool. You can see that everything looks pretty much the same as the current site but it has an updated look and feel. Some of the colors/sizing/layout will probably change slightly based on the feedback we get during testing but for the most part what you see above will be very close to what the final V4 release will look like. When I built ClearCheckbook back in 2005 for my own personal use I definitely didn't foresee the site that we have today. With over a quarter million users and over fifty million transactions (with tens of thousands more being added daily) I couldn't be prouder of how the site's grown over the years. Thanks for all your support and I look forward to providing you with the best money management tool out there! We've passed another milestone today by now storing over 50 million transactions that our users have entered. We're averaging about 28,000 new transactions added each day which is a huge amount! We're extremely happy to see the site continually growing and we have some great updates planned for the future. We'll post more information about these updates over the next couple of months. Thanks again for using ClearCheckbook! If you've tried to access the site over the last couple of weeks you might have noticed some slow load times or even some site outages. We've been trying to figure out what the problem is and have been updating various aspects of the site, server and database to try to increase reliability. We finally found the root of the issue and fixed it. There should be no unscheduled down-times or overloaded databases now. We knew the issue was database related. We were keeping track of long running queries that would start causing a snowball effect that would eventually cascade into a database overload. All of the queries were coming from the massive 40+million transactions table in our database. The problem was there was no rhyme or reason to the long running queries behaving the way they did. They would perform fine on some accounts and not at all on others. We used this as a starting point and worked from there. We initially thought it was a vacuuming issue (basically keeping the table in check for quick access) where the table was too large and the vacuum would die part way through. That's why we took the site down last night to run a full vacuum on the table. Unfortunately, as many of you noticed today, that didn't help. The issues persisted and the database continued to overload. Fast forward through a lot of high blood pressure inducing brainstorming and we finally realized the transactions table was highly fragmented across our hard drives. All of the adding/deleting of transactions left data all over the place. This meant it took much longer than normal to access all the data quickly and efficiently. We ended up dumping and reloading the data cleanly and sequentially on our hard disks and that fixed the problem. Everything appears to be fixed now with the transactions table. Over the next week we'll be conducing the same action on our other large tables to help improve site performance even more. We'd like to thank you all for dealing with these issues as we've encountered them. I launched ClearCheckbook in 2006 because I wanted everyone to be able to quickly and easily have access to their financial information. Whenever the site goes down I do my best to be transparent and let everyone know what's going on and work to fix the problems as quickly as possible. ClearCheckbook has grown tremendously over the last few years (we just passed our 250,000th registered user) and we've had our technical hurdles from time to time. Each time we learn something new and work to make sure nothing like that happens again. Please rest assured that ClearCheckbook is my #1 focus and we're doing our best to provide you with the best money management site and app suite available. As some of you have noticed about once a week it seems like the site really starts to slow down and get sluggish or not let you log in. This is caused by a few issues which I'll explain below. We're also working to fix these issues so the site continues to run quickly and efficiently in the future. ClearCheckbook has massive amounts of data we have to process each time you perform an action on the site. To give you a little perspective, we have over 39 MILLION transactions in our database. On an average day we're getting almost 50,000 new transactions added to the site. This is a lot of data to handle and some of the reports or search functions require processing a lot of this information. The database queries to perform some of these actions are very complex and can take a while to complete. What we've noticed by looking at our logs after a site outage is that people get a little impatient and refresh the page or click the search button several times in a row which adds to the list of complex queries being run. It acts a bit like a snowball where the more of these complex queries that add up, the longer it takes the site to get to other less intense queries. If enough of these build up, it causes the slowdowns you experience. We're usually around to catch these pretty quickly but sometimes they happen early in the morning before we're at our computers. This is something we've had to deal with since we launched the site almost 7 years ago. ClearCheckbook is very popular and always seems to be growing. We're not complaining about that at all, but it seems like with each growth spurt we discover new issues that arise due to large amount of traffic hitting the site. When you combine both of those issues, it means our site is getting used at all times by people all over the world and there's constant database activity. As more people use the site, more of those complex queries are getting regularly run. Each time the site goes down it's because of the database being overloaded. When this happens we can look at the longest running queries to figure out what started the so called "snowball" mentioned above. Whenever this happens, we look at the queries in question and work on optimizing them and the database to prevent this from happening again. We've fixed countless queries and performed more optimizations to the site than we'd care to admit and we believe we're getting close to optimizing all of these complex queries that take a little longer to run. I built ClearCheckbook because I wanted a way to easily manage my money. When I made this my full time job in September 2009 it became my main focus and all I wanted was to see the site succeed and help people with their finances. Whenever the site has these hiccups it may frustrate you, but believe me when I say that it's infinitely more frustrating to me. We have almost a quarter million registered users so whenever there's a site issue I feel like I'm personally letting everyone down. All I ask is that you're patient with us while we're going through some of these growth spurts. We're constantly working to make the site better by providing updates, new features, quick bug fixes and more. You can now add the ClearCheckbook Money Management app through the Chrome Store. The ClearCheckbook Money Management app is a quick link to the main site so you can easily access your account from Google Chrome. The Chrome Web Store is an online marketplace where you can discover thousands of apps, extensions and themes for Google Chrome. Help us get some extra exposure to the site by adding ClearCheckbook to your list of apps! We wanted to share with you a roundup of ClearCheckbook during 2011 and a sneak peak into what we have in store for 2012. Getting right to it, 2011 was a great year for ClearCheckbook. We had a total of 44,563 new user signups (which comes to about 122 signups per day). All of our stats were up across the board from 2010. The screenshot below shows 2011 (blue) compared to 2010 (orange) for total visits to the site. In 2011 we had 2,085,159 visits (374,202 unique) to the site which racked up an impressive 12,646,329 pageviews. The average person visits 6 pages each time they come to the site and spends an average of 7:30 on the site. As we said above, all of these stats are up from 2010. During the year we weren't just sitting around twiddling our thumbs either. In 2011 we released two completely new tools, the Bill Tracker and the Debt Snowball tool. We also released 3 new large features to existing tools: Checking for Duplicate Transactions on import, Saved Searches and Saved Custom Reports, and the Premium Groups feature. In addition to the new tools and features, we also completely overhauled several existing functions of the site such as the Import tool, Estimating Future Balances, Reports, Currency Conversions, Bill Tracker and our entire database. On top of all that we still managed over 100 bug fixes and minor updates. So with all of that covered, what's in store for 2012? The first half of the year is going to focus on digging through our backlog of requests and suggestions and working on introducing any that we feel will benefit the majority of our members. We're also going to completely scrap the existing iPhone app and build something that actually works the way it was supposed to from the start. Along those same lines, the mobile optimized website will be getting a complete overhaul to make it more usable and give it access to some of the newer tools and features. We'd also like to thank everyone who sends us email with testimonials and praise and those of you who spread the word of the site to your friends and family! You're the reason we do what we do. Help us out and get a free year of premium membership! We're calling upon you, our ClearCheckbook users, to help us create some walkthroughs/tutorials on how to switch from other financial applications (like Quicken, Microsoft Money, Mint, etc) to ClearCheckbook. Our goal is to have some nice documentation to provide for new users who are looking to switch from another application but aren't quite sure how things match up. Ideally each tutorial would cover some basic terminology comparisons, how to properly export data from the old financial app so it can easily be imported into CCB and any other helpful information that a new user switching to our site might need. Screenshots to go along with the documentation are always welcome. Anyone who writes a comprehensive tutorial for us will get a free year's worth of premium membership added to their account. If you're interested, just contact us via the link at the bottom right side of the page and let us know what app you're interested in writing a switching tutorial for. Vote ClearCheckbook for the 2011 Reader's Choice Awards on About.com! The nominations were tallied and ClearCheckbook ended up being one of the top 5 (out of 75) online personal finance software for About.com's 2011 Reader's Choice Awards. You can now go vote for us through March 8th. There are no prizes or rewards associated with winning, simply bragging rights. If you love ClearCheckbook.com, show your support! Thanks to everyone who sent in their nominations earlier last month! ClearCheckbook has had a great 2010 and we look forward to making 2011 even better. In 2010 alone, we had more new signups than the previous 3 years combined, closing the year with around 147,000 users. In 2010 we also released mobile apps for WebOS, Android and iPhone. These mobile apps have brought in over 45,000 new users alone. We know there are some feature requests and updates needed for the mobile apps and we will be addressing these in 2011. What does 2011 hold in store for ClearCheckbook.com? We're currently working on a complete overhaul and refresh to the site. We've been working on it for about a month and will continue putting more time and effort into it as we progress. This new refresh is taking many of the suggestions we've received over the last year into account while building the next version. Aside from new features and tweaks to the way current features work, we're re-coding the site from the ground up to help make future growth easier. The new site will visually look pretty similar and behave about the same as the current version, but everything will be quicker and much more intuitive. We know you've become adjusted to the way the current site works, so we are striving to keep things as similar as possible in the next version. Along with a refresh of the website, we're also working to release updated versions of all mobile apps in conjunction with the launch of the new site. This is a huge undertaking but we know it will pay off by making things even smoother between the website and mobile apps. While I'm not going to start tossing out any kind of deadlines for the next version of the site yet, I just want to reassure you that ClearCheckbook is going strong and we're going to continue to be an industry player and make money management even easier. We haven't been as active in the Support Forums because we've been focusing most of our resources on the development of the new site, but if you have any questions that go unanswered there, please don't hesitate to send us an email by clicking on the Contact Us link at the bottom right side of the page. We always answer any email that requires a response. Thank you for a great 2010 and we look forward to making 2011 and the upcoming years even more exciting. We're working on updating the Budgets tool to allow for transfers and deposits to be included as options. We would like to get some real user feedback about these and to ensure they're working properly before we release it to everyone. If you're interested in testing this out, please use the Contact US form at the bottom right side of the page and let us know. Looking for Spanish speakers using the translated site! We're looking for any Spanish speaking users who are currently using ClearCheckbook and are interested in speaking to an author who is writing a story for the AARP VIVA magazine. If you are interested, please use the Contact Us form at the bottom of the page and let us know. The author is looking to wrap the article up by Thursday, so the sooner you can let us know, the better. Great news for everyone waiting for an iPhone app. Late last week I got in contact with an iPhone developer who signed onto the project. We met today for a status update and he's making some great work. We are meeting again on Sunday to go over some final updates, but we should be submitting the app to the App Store within the next two weeks. Sorry for the delay in getting this done, but we're almost there. The ClearCheckbook application for Palm WebOS has been updated to include reports and budgets as well as a few bug fixes and performance tweaks. The reports allow you to check out pie charts for your spending categories and line charts for your overall account deposits vs. withdrawals. With the budgets, you can view, add, edit and delete your spending limits so you always know how you're doing with your budget. The update is available now from the app catalog and is completely free. 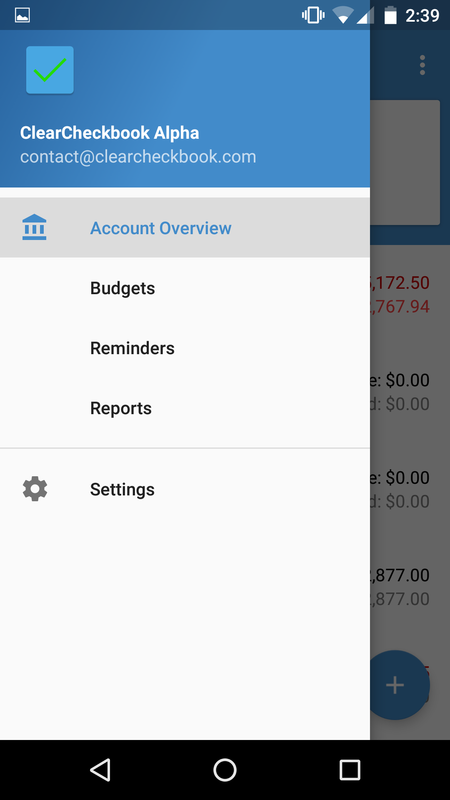 ClearCheckbook App to manage finances on Android phones! ClearCheckbook is proud to announce the release of the ClearCheckbook app for Android phones! Now you have the ability to view your balances, add, view and manage transactions, manage your accounts and manage your spending categories all from your Android phone! You can learn more about the Android application as well as find a user manual here: https://www.clearcheckbook.com/app/android/. We will be working on enhancing the UI and adding some more features to the application as time goes on. We wanted to get a functioning app out first so everyone could at least start using it. ClearCheckbook App to manage finances on Palm WebOS! ClearCheckbook is proud to announce the release of the ClearCheckbook app for Palm WebOS! Now you have the ability to view your balances, add, view and manage transactions, manage your accounts and manage your spending categories all from your Palm WebOS phone! You can learn more about the Palm WebOS application as well as find a user manual and link to the application here: https://www.clearcheckbook.com/app/webos/. We will also be releasing our Android application this week, with an iPhone application soon to follow. I wanted to give everyone an update on where we stand with the mobile apps. We have been putting the finishing touches on our API that we're using to interact with the apps and have been making some good progress on the apps themselves. We will be adding a ClearCheckbook app to the Android marketplace and Palm WebOS App Catalog some time the week of February 1st. The iPhone application will be added soon after those. After releasing the apps we will be opening up our API so other people can start developing for more devices and platforms (like the blackberry and various widgets for sites all over the web). We will post more information when the apps are released. Nominate ClearCheckbook for a Crunchies Web Award! Enjoy using ClearCheckbook? Help and nominate us for a 2009 Crunchies web award! There are only 4 more days to vote! Voting ends at Midnight on December 4th PST. Simply click on the links and then hit the Nominate button. It's that easy! Balances seem off? Check the year. I have had a few people email me asking why their balances are wrong and it seems like the site is calculating a transaction twice. What seems to be happening is people enter transactions with 2008 instead of 2009 and then don't see it at the top of the list and add it again, this time with the correct year... thus giving you two transactions and throwing off your balance. This is mostly happening for transactions that are taking place at the first of the year. Some people are entering January 1, 2008 instead of January 1, 2009. The transaction then gets placed way back in the beginning of 2008 transactions and they don't see it... so they add it again, throwing things off. So to sum it up, if something seems off, go back and double check that you didn't put the wrong year in when you were adding transactions. If that doesn't seem to be the issue and you know everything else is correct, try clicking the "Refresh Balances" link that's located under the Account Overviews on the Dashboard and Summary pages. ClearCheckbook is proud to announce the launch of Version 3 of the site. This version upgrade comes with many new features, an updated look, and the ability to become a Premium member. To start, we'll tell you about the Premium Membership. A Premium Membership gives you access to some new and exciting features such as the ability to view all transactions that were edited and deleted and gives you the power to restore them. The Premium Membership also displays the running balance on the Account Summary page and gives you the ability to estimate Future Balances. The Premium membership costs $4 per month, but you can also purchase multiple months at a time at a lower cost. We do want to emphasize the fact that the site will always remain free for you to sign up and use. However, we believe that offering a Premium membership is a great way to help grow the site and keep the site competitive for both free and premium members. To learn more about the Premium Membership, check out the premium information page. Some of the new features added to the site are the new Dashboard that replaces the Account Summary page. Here you can quickly add transactions, view reports, check out your spending limits, view upcoming reminders and recurring transactions and more. Rather have the old Account Summary back? That's fine too, it's as easy as clicking a link on the Summary page. You can now add transactions from any page without actually leaving the page. This will make it easy to quickly enter your transactions while browsing other parts of the site. The reports have also seen an extensive overhaul. The look of the reports have been greatly improved over the previous version of the site. You can also dynamically compare your spending categories against each other in a new report. We now give you the ability to mass delete transactions by clicking on a checkbox next to each transaction you want removed. If you're a premium member, you can also use this method to mass edit transactions. If you're curious about how to use some of the new features of the site, check out the tour page. We have some videos that walk you through some of the key features of the site. The iPhone and iPod touch webapp has also been upgraded and now has the complete set of features the normal site has. You can learn more about the mobile site by going to the mobile page. There are still a few things we will be slowly launching over the next few weeks. One of the main new features will be the ability to view the site in different languages. We have several people helping to translate the site into various languages and when we receive those back, we will put them up. We encourage you to check out the site and see all the new features first hand. We're finally ready to set a firm date on when V3 will launch. The official launch of V3 will be Monday, December 22nd. We have been working very hard over the last few months developing the site and testing it over and over again. We will have to take the site down for a few hours over the weekend of the 20th just before launch of V3 in order to update the database and server, but we'll post more about this when the time comes. Thanks everyone for waiting patiently. I know the next version of the site is going to be even more helpful than the current version in helping you manage your money. It has been a little while since we gave an update to the progress of ClearCheckbook version 3. Over the past few months we've been working very hard to get everything updated and added to the new version of the site. As of now, we only have two more features to rebuild for the new site (Reminders and Reports) plus a few more smaller additions and general cleanup. We are looking to launch our private beta testing of the site in about 2 weeks and will use that time to fix any bugs and finalize the layout and other things like that. We're sorry for the slight delay in launching the new version, but we want to make sure everything is there and working smoothly before the launch. In a couple weeks I will post more information about the beta testing and how to sign up for it if you're interested. June has been another great month for ClearCheckbook. We've had over 275,000 transactions added this month with around 2,000 new members sign up for the site. If these numbers keep up, we're set to break the 3 million transaction mark some time in July. We hit our donation goal again for June! A huge thanks goes out to everyone who sent in a donation. We upped the goal slightly for June and we still achieved it. The average donation coming in is around $5. A lot of people have been donating that amount on a monthly basis which is really cool. More version 3 work has been going on lately. I have started getting up at 5:00 in the morning to work on V3 for a few hours before heading off to work. We have also added another developer to the team to work solely on V3. New estimates for when you will see the site is August/September. We hope to have the next version of the site open for beta testing in August and then a few weeks after that fully launch the site. We want to have a few weeks of beta testing so the new version will be completely solid. With the basic groundwork of ClearCheckbook V3 underway and August fast approaching, I would like to extend an offer to any developers out there who would like to help work on the next great version of ClearCheckbook. V3 is being completely re-written from the ground up and is now being built on the Zend Framework. Having used the MVC method of coding PHP is a major plus. I would also like to hire someone who currently uses the website, as they will have a working knowledge of how the site currently behaves. While this isn't a necessity, it would be very nice. The chosen developer will be compensated for all work done on the site. The exact terms will be finalized with the chosen developer. I will be accepting applications until Wednesday June 25, 2008. Like most other months, April has continued to show growth in the site. We had 300,000 transactions added this month with over 1,600 new active users. Our donation goal was also met within the first two weeks of the month and that's great news! Development of V3 is still going strong. We have the new layout up and some of the other basic functionality of the site working on our development machines. We've also started working on some of the more unique and new features for the site and they're already looking really cool. If you're using Internet Explorer 6, we would like to strongly encourage you to either upgrade to Internet Explorer 7 or more preferably, download and start using Mozilla Firefox. It seems like more and more of the emails coming into us about login issues or data not getting updated (because it's getting cached by IE when it shouldn't) all revolve around the fact that Internet Explorer 6 is an extremely outdated browser and should not be used. If you are still having issues and have tried the above instructions, please send us an email and let us know. Please strongly consider upgrading to a new browser if you're able to. Well, it appears that for some reason CheckBot's account was suspended by AOL for some unknown TOS violation. While we work on getting the original name back, we unfortunately needed to change the screen name to "clearcheckbot" in the mean time. This means you'll need to update your buddy lists and text messages to point to that instead of "clearcheckbook". Sorry for the inconvenience. We're working on fixing the issue. 1,000,000 Transactions and 10,000 Users! Yes, that's right. ClearCheckbook has now passed the 1 Million transaction point and has over 10,000 active users. This is a great milestone for the site and I would like to say thanks for everyone who uses the site daily and helps spread the word of the site to other people. The 1,000,000th transaction and 10,000th active user marks were met within about 24 hours of each other, which is great! V2 is still scheduled to be made live some time on Sunday Night. Again, the site and CheckBot will be taken offline for a little while so we can update the backed database without new information being written. We'll make the transition as quick as possible so you can start using the new version right away. Thanks again and congrats everyone! Two days left for developer submissions. That's right, there are 2 days left to submit your information if you're interested in developing for ClearCheckbook.com. We've had a lot of good applicants submit their information to us already, but the more choices we have the better. That's right, there are 10 days left to submit your information if you're interested in developing for ClearCheckbook.com. We've had a lot of good applicants submit their information to us already, but the more choices we have the better. Interested in Developing for ClearCheckbook.com? ClearCheckbook opened for public use on May 20, 2006 and has since grown to around 6,500 active users who have entered over 600,000 transactions. Up until now, there has only been one person coding/maintaining/answering questions/troubleshooting/running the site, and that's been me. What started out as a personal project for myself has grown far bigger than I ever could have imagined. I thought I had the time and energy to keep the site updated and evolving as the demand came in. Recently I've come to the realization that I simply have too many projects on my plate and can't keep ClearCheckbook updated as needed. Unfortunately, this will have to be an unpaid position as the site doesn't actually make any money. The donations we receive are used to cover the costs of hosting and everything that goes along with it. The ideal candidate is someone who enjoys seeing other people benefit from their work and wants to help people stay on top of their finances by providing the best site out there for just that. Being a user of the site is also a great plus, but not a requirement. If you're interested, please email me a brief resume and some sites you've worked on or currently work on as well as a little bit of information about yourself. You can send all information to brandon [at] clearcheckbook [dot] com (modified to prevent spambots). I'll be accepting resumes until August 31st. I look forward to hearing from you! ClearCheckbook was mentioned in the August edition of Money Magazine in a segment about cutting your spending with free tools. We were mentioned along with two other software alternatives. "Pros: Info is stored online so you can access it anywhere. You can add expenses as they happen via cell phone or IM. The program also reminds you of recurring expenses. Con: Budget resets every month, so if you've underspent on groceries, say, the balance doesn't roll over." Here are images of the cover and story. For those of you who found the site from this article, welcome! Please let us know your impressions and any comments you have by posting here in the blog or sending us a message. If your publication or blog would like to talk to someone about ClearCheckbook, please use the Contact Us form and we'll be happy to point you in the right direction. Half of a Million Transactions recorded! Last night we passed the 500,000 transaction mark. This is yet another huge milestone for ClearCheckbook and it's great to see the site doing so well and continually growing. Getting over half a million transactions in a little more than a year should tell you a little something about how many people use the site on a daily basis and how we're helping a lot of people stay on top of their money. Development of V2 hasn't been making huge progress due to other projects and other time restraints. In another week or two, the load on the developers should lighten up greatly and we can focus a lot more time on getting v2 out the door. Got an iPhone? You've got ClearCheckbook. Reports are starting to trickle in from our users who recently purchased an iPhone and they're telling us that the ClearCheckbook performs beautifully on the iPhone. We had to delay our development of the mobile version of the site due to some other projects, but we will soon begin working on it again. The new Mobile version of the site will be optimized for devices like the iPhone, taking load times and the amount of data displayed into consideration. Are you currently using an iPhone? Let us know how the site works for you or if you've noticed any problems with the site by sending us a comment or posting a response to this blog post. Yet another month has come and gone and we're still going strong. We currently have over 3,800 active members who are tracking over 307,000 different transactions. We reached the quarter million transaction mark this month and have far surpassed it. There hasn't really been too much in the way of updates to the site this month as most of the focus has been shifted towards preparing Version 2 for launch at the end of May. The beta testing should be open in a couple weeks and we'll start taking names for those of you who are interested in testing the new version of the site out before we release it to the public. Other than that, keep telling your friends about the site and stay tuned to the blog for more updates on version 2. ClearCheckbook has continued to grow during the month of March. We've had about 500 new members start using the site and there have been over 75,000 entries made this month alone. With all the new entries we finally passed the $100,000,000 amount in transactions. We continue to receive emails on a daily basis from people telling us that we're helping them out so much and that they're telling all their friends about the site. To those of you who do that, thank you! March has also seen the additions of some ways to keep your finances close to you. We released the Google Homepage Gadget so you can view your account balances directly from your Google Homepage and we released the Mac OS X Dashboard Widget that also allows you to see your account balances whenever you view your dashboard. A large number of you quickly adapted and started using these features and that's great to see. The reports have also been improved so they now load extremely fast and have added charts so you can see a breakdown of your accounts as well as categories. The next few months are going to bring some big updates to the site and we know you will love them. Stay tuned to the blog for more updates on those. You can subscribe to an RSS feed of the blog by clicking on the orange icon on the right hand sidebar or by clicking here. No, not by paying us! We want to hear any suggestions for updates, feature requests, ways to improve the site or anything else you've been thinking about. We're getting ready to gear up for some major upgrades to ClearCheckbook for its one year anniversary on May 20th. We've also got some big new features planned for release around May 20th as well. We know you'll be excited to see those. Also, stay tuned for a blog post some time near the early-middle part of April asking for some beta testers for these new features. We're going to open a limited beta for some of you to get a months head start on testing out these new features and new version of the site! So please, if there's anything you've been wishing was a feature on the site or you think something would work better if it was handled differently, please let us know by sending us an email with the Contact Us form. It doesn't matter how big or small the request is, we just want our inbox filled with them so we can look them all over. We won't promise to add all the features and requests, but we will read them all and implement the most requested / best ones. Thanks for making the site great! That's right. ClearCheckbook just surpassed $100,000,000 in transactions today. Right now we're nearing 2,900 active members (meaning they've verified their account and have added entries to the site) and are at almost 170,000 entries. I'm glad to see the site growing so well. If there's anything else we can do to make the site better for you, let us know in the comments or by using the Contact Us form at the bottom of each page. February has been an interesting and exciting month with ClearCheckbook. At the beginning of the month we started out with around 1,750 active users and 28 days later we're almost at 2,700 active users. We reached and passed the 150,000 entry mark and are getting almost 1,000 new entries every day. February has also brought some much requested additions to the site. We introduced a way to add new categories and accounts on the Add Entry page. This makes it much easier to add accounts and categories on the fly. The Accounts Overview has also been added to the accounts page. Now you can see an listing of all your accounts and their balances quickly and easily. If you don't want to see it, simply hide it (and to get it back, just click the show button and it will reload automatically). The Help section was also added this month. Now everyone has a quick and easy way to find out how to use the different sections of the site. There are around 80 questions, so pretty much anything you might have a question about should be listed there. As shown by the statistics I gave earlier, the site has been growing incredibly fast... almost 1,000 new active members this month alone! With that increased traffic came some inevitable growing pains. As witnessed by those using the site the night of February 27th, our site finally became too large for our old web host and they shut us down. As we've said in the two previous posts (here and here) we spent several hours scrambling to get everything back up and running with as little downtime as possible. We basically had the rug pulled out from under us while carrying a tray full of crystal glasses. There were a few bumps along the way, but I think we did a pretty good job with what we had to work with. This morning we finally moved the site to its permanent home on a new server that's solely for us. The SSL certificate has been replaced with a newer one and will no longer be giving the warnings you were seeing during our transition period. Thanks to everyone who's sticking with us. Seeing your encouraging words in the blog posts and in emails regarding last night's hiccups reaffirms my belief that we're offering a great service to everyone and you're completely awesome! Continue to tell your friends about the site, blog about us, and spread the word and keep the site growing. The bigger the site gets, the better it gets. Anyone who's been with us from the beginning can tell you this. If you have any suggestions for improvements on the site, please feel free to use the comments here or the Contact Us form to let us know. ClearCheckbook.com has finally found its new permanent home on a brand new server. Those of you who experienced all the problems during the last 24 hours will be glad to know that pretty much all of those issues have been resolved now (We're in the process of getting a new SSL Certificate so you won't be prompted to accept it each time you visit the site). Why did we have to get a new server? ClearCheckbook grew far faster than we had anticipated. While using a shared hosting plan was ideal at the time, we quickly outgrew our welcome as the site was drawing a lot of traffic. Things finally got really heavy yesterday as we were featured on DumbLittleMan and our traffic shot out the roof again. Our host pulled the plug on us and said we're using way too much bandwidth and processor power for a shared hosting plan. Without any warning we were suddenly without a website. We scrambled for a few hours to get everything moved to a temporary location while we made plans to upgrade to a permanent server. After a few more bumps, the transition to our new server has been completed. What's this mean for the site? Stay tuned for updates and new features as we produce them. The most pressing issue right now is the new SSL Certificate. This should be up and working within a day or two. I want to extend a personal thanks for everyone for sticking through this rollercoaster. When we were planning the natural evolution of the site, we didn't account for such quick growth and were forced to act fast and update the servers in order to keep the site alive. Welcome Purdue CSR 342 students! Last semester the CSR 342 course was the first to use ClearCheckbook as part of the course curriculum. The Professor and I had a few meetings to discuss how it could be used and it fit in very well with the exercise on spending. It appears that they are using ClearCheckbook again as several Purdue students are registering. Last semester the course held around 300 students and I'm assuming this semester will be the same. So, welcome CSR 342 students from a December 2005 Purdue Alumni. I also took CSR 342 in the Fall of 2005 before ClearCheckbook was even open to the public and for my personal use. If any of you have any questions on how to use the site, please post here in the comments or send us a message by clicking the "Contact Us" link at the bottom of every page. In order to use the Credit page, you need to have at least one credit card set up on the site. To do this, go to the "Settings" tab and click on "Manage Account Types" and make sure one of your accounts has the type "Credit Card." When you make purchases on your credit card and add them to the site, they will show up on the "Credit" page. To get to the "Credit" page, click on "Accounts" and then click on "Credit." This page will list all your credit card purchases. If you have multiple credit cards, you can use the drop down box to select a specific one. The main goal of the Credit page is to allow you to "pay off" your credit card bill and identify which purchases were included on this bill. To do this, when it comes time to pay off your credit card bill, select the check box next to each payment listed. When you have selected all the payments on the bill, click the "Pay Purchases" button. This also serves an additional purpose of making sure that all entries on your credit card statement are accounted for. There's nothing worse than trying to track down some purchase you don't remember making. Keeping track of everything in ClearCheckbook will help reduce these headaches. After you click "Pay Purchases" it will take you to an "Add Entry" type page that automatically fills in the total amount of your bill (assuming you're paying it off in full) as well as all the payments included on this bill. You can enter the rest of the information, like the description, account you're paying with, etc. When you are done, click "Pay Card" and it will archive all the credit card purchases for that bill and replace it with your payment. If you want to go back and see what purchases were included on any payment, go to the "Credit" page and there is a section that says "Paid Credit Card Purchases." This section will list all your paid payments and you can click on the name of the payment to see all the purchases that were paid off for that specific bill. This is a really powerful feature that helps a lot of people, but I know that some people are often confused and don't know how to use it. Hopefully this helps clear some things up and you can start using the Credit page to help you manage your credit card payments. 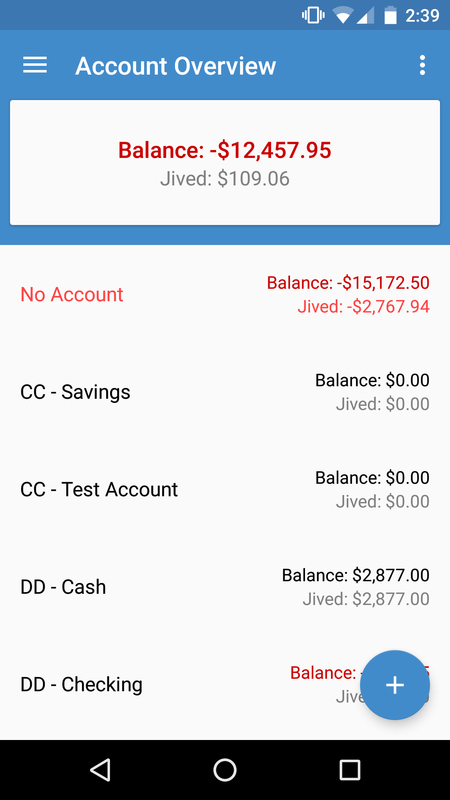 The Jive page is a very helpful tool for you to keep track of your money and check all of your purchases with what your bank is saying you made. This is basically the Web 2.0 equivalent of the century old checkbook balancing tool. When you load up the Jive page you will see all your accounts listed at the top of the page. You can click the check mark next to the specific accounts you wish to display. For example, I have a checking account with Bank of America. I regularly make purchases with my debit card and check my Bank of America account online. So if I wanted to check and see if my purchases match up with what Bank of America says I've made, I log into my Bank of America site and click on the checking account. I view the list of purchases and deposits and then go back to my Jive page on ClearCheckbook and select each entry. This lets me see if there are any entries in my account that I did not make. A great example of how this is useful is something that happened to me recently. I was traveling and flew into the Chicago Ohare airport and bought some pizza at one of the vendors for lunch. I was charged the 6 bucks or whatever the day after I made the purchase. A month later another charge for the same amount was made from the same pizza place at the airport. Since that withdrawal wasn't in my ClearCheckbook jive page I knew something was wrong. I contacted the bank and told them the story and had them credit my account back. They did and everything was fine. Without jiving my account I probably never would have found this and lost 6 bucks. After you jive all the entries your bank account lists, there is a total at the top of the page that says "Jived:" and some amount. This amount should match what your current balance is on your banks website. If things don't match up, you know something is wrong and can do some detective work to figure out what that is. So in short, the Jive page is there for you to check with your bank statement and make sure all your withdrawals and deposits are accounted for and no one has messed up and charged extra purchases to your account. If you have a story about how you use the jive page or how it helped you find an error in your bank statement, post about it here in the comments! With New Years a week behind us, have you stuck to your resolution to keep your checkbook balanced or keep a better watch on your budget? If you made a resolution regarding your spending, ClearCheckbook.com is here to help you keep your resolution and help you stay on top of your finances. With our easy to use interface you can keep track of all your savings, checking and credit card accounts in one place. You can balance your checkbook, view reports on your spending, import and export your records, plus update your account from anywhere with CheckBot. Do you know someone who made a money related resolution this year? If so, let them know about ClearCheckbook. We're positive that after just a few weeks of using the site they'll be thanking you. Happy New Year! We hope that all our current members continue to enjoy using the site and that new members will continue to join and experience how easy we make managing your money. In order to bring you the most up-to-date news about ClearCheckbook, tips on how to use the site, articles about managing your money, and much more, we have decided to create this blog. Anyone who has an account on the site will be able to leave feedback on the blog in the form of comments. Rest assured that your email address will not be displayed if you leave a comment. The only thing that will appear is your username. If you have an article you would like us to publish, use the Contact Us form and send it to us. If we think it will be helpful to other people, we'll post it. We went ahead and copied the more important site updates into the blog from the previous upgrades page. If you would like to see the old list of all the updates, you can click here. There is also an RSS feed for the blog. You will be able to subscribe to it and be notified right away when a new post is made. You can access the RSS feed in Firefox by clicking on the orange icon in the address bar.